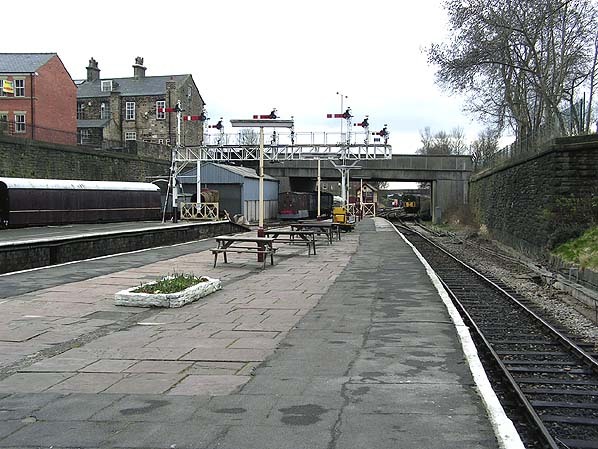 Looking south along the southern end of platform 4 at Bury Bolton Street station in March 2008. By this date the 'new' ELR had recreated the junction between the former main line to Clifton Junction and the 'Bury East Fork' which connected Bolton Street with Knowsley Street. By this date the main line only continued for about one mile into the former locomotive depot and electric train sheds which house the ELR's rolling stock. The route through the site of Knowsley Street however continues all the way to Heywood and beyond to Castleton Junction, with ELR trains terminating at Heywood.